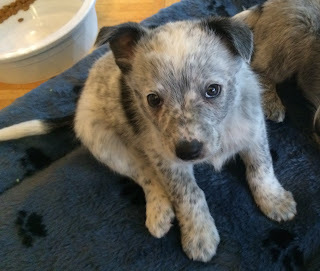 Cattle Dog Kids: My name is Lucky! The story of the lives of Cato and Lucky, brother and sister cattle dogs. My name is Lucky and I am a spayed female Cattle Dog. I weigh 46.5 lbs. I am shorter, but heavier than my brother Cato. I am a bit hyper and love to play all of the time. I love to play ball, go swimming and beat up Cato. When I play ball with Cato I usually always get the ball. My favorite toy is my donut, a hard rubber ring. My vet said that I am a hoarder because I hoard all of our toys and won't let Cato have anything. I love treats and I can eat mine very fast and sometimes manage to steal Cato's. I do not like my crate and when my daddies put me there when they go out I bark and howl until they come back. I love to go for walks but I do not behave very well. I also bark at just about everything I see, especially kids playing, because I want to play with them. I love to go swimming in the pool and playing ball there, but Cato is too afraid to come in the water with me. Our first day in our new home. What Should I Put On My Dog’s Tag?